Every kitchen requires a source of heat to cook, bake, or warm food. Cooking appliances use either electric or gas fuel, and may be configured as ranges, cooktops, ovens, or microwaves. You can choose commercial appliances or those with a pro look. You can either cook like a pro or look like a pro! But there can be a big price difference between the two. Ranges may be either freestanding, slide-in, or drop-in models. They are typically 30 inches wide, although some ranges are narrower for installation in an apartment or small kitchen. Ranges usually use electric or gas fuel, although some dual-fuel ranges have gas cooktops and electric ovens. Range features may include modular elements, sealed burners, or convection ovens. Gas models have electronic ignitions; on some newer models, the gas shuts off if the flame is blown out. Commercial-style ranges are available, but they are expensive and require good ventilation because they generate high heat levels. Pro style ranges look like commercial equipment but are designed more for the consumer. They are designed for reduced heat output, so they can be placed next to a wall or wood cabinet. Some European ranges are even custom made. Separate cooktops and wall ovens allow more customization in the kitchen layout and may work better for multiple cooks. It can also be cooler to cook over a cooktop without a hot oven nearby. Modular cooktop units can be installed with a selectable number of burner units, or two cooktops can be installed in different areas of the kitchen. For example, a separate grill unit can enable two chefs to work together in the same kitchen. Electric cooktops use coil, halogen, induction, or ceramic glass heating elements. A combination of these heating methods can be used in a modular cooktop. Interchangeable parts such as grills, griddles, woks, fryers, and steamers are available from some manufacturers. Some models even have downdraft ventilation systems, eliminating the need for an overhead range hood. When choosing an oven, consider size and capacity issues. You may even want two ovens — an electric model for baking and a gas one for broiling. Another option is a convection oven which has a fan that circulates heat as it bakes. Some ovens combine these features. If you bake or entertain a lot, choose an oven with extra capacity. 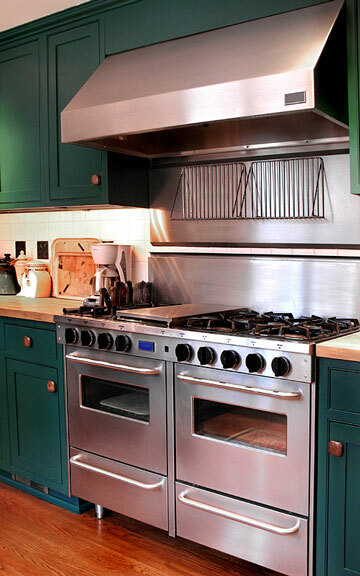 Many ovens are 27 to 30 inches wide instead of the standard 24 inches. For kitchens with narrow traffic lanes, wall ovens are available with doors that hinge on each side and open from the middle. And to give us more time in our busy schedules, keep oven maintenance to a minimum with a self-cleaning model. Microwave ovens save cooking time. They are great for defrosting and reheating foods quickly, but they don't roast and brown meats well. The newer convection microwaves do a better roasting job, but cookware used in all microwave ovens is restricted to non-metallic containers made with ceramic, plastic, or paper materials. 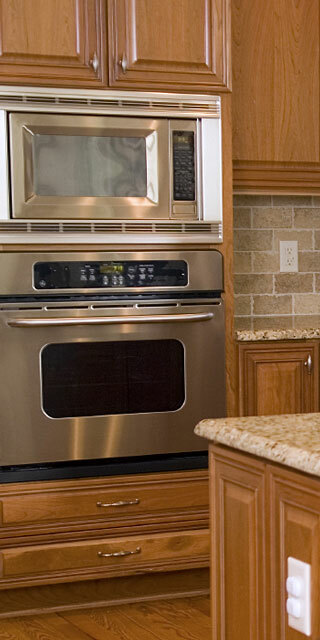 A microwave oven can be installed over a wall oven, cooktop, or range, or even built in by itself. It can be freestanding within a specially designed wall cabinet, or it can simply rest on a countertop. Some newer, under-counter designs operate like a drawer and are great for island kitchens. Most microwave ovens have multiple programs and settings for quick and easy use. Warming drawers are used to keep cooked or baked food warm. They are usually installed in cabinetry under the countertop, and they keep food at an ideal temperature without cooking it further or drying it out. They're a great idea for families running on multiple schedules! How much better to have a home-cooked meal waiting than to depend on fast fare. 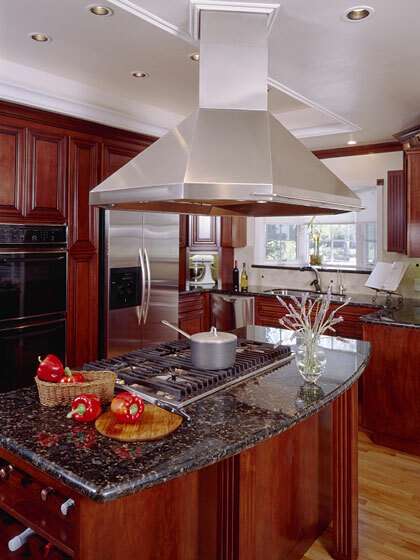 Range hoods are used to remove heat, smoke, steam, and cooking odors from your kitchen. A range hood can also prevent grease and grime buildup on cabinets, counters, walls, and floors. Ideally, these hoods should be vented to the outdoors. A powerful, vented range hood is especially necessary for a commercial range. Elegant custom range hoods may be handcrafted and designed to fit your needs and decor, quite a decorating statement for your kitchen! An alternative to a range hood is a down-draft ventilation system. This type of system is often installed in an island cooktop. Another alternative is a ductless hood, but these generally do not remove heat and grease as well as ducted ones. They are, however, useful in communities which do not allow ducted ventilation. For the ultimate coffee experience at home, one trend today is to install a built-in coffee maker or espresso machine. These home baristas integrate into your kitchen wall or cabinetry and make perfect coffee, espresso and cappuccino. However, remember you will have to install plumbing for the water line. These trend-setting units enable you to avoid the coffee shop and brew your own coffee or espresso at home! The American Council for an Energy-Efficient Economy (ACEEE) discusses the pros and cons of various cooking appliances and offers a series of tips for energy-efficient cooking. If you are looking for professional grade cooking appliances, you may wish to consider Wolf Cooking. Wolf features an entire line of ranges, cooktops, and built-in ovens as well as microwaves, range hoods, and outdoor grills.